FOODIE BUCKET LIST: If you ever find yourself in San Sebastian or Bilbao in Spain you must take a detour to ASADOR ETXEBARRI in Atxondo for one of the least complicated, but awe-inspiring meals of your life. In my experience you’ll find some of the best cooking in Spain and chefs often do very little to the ingredients — like grilling with just kiss of flame and smoke — ending in spectacular results. 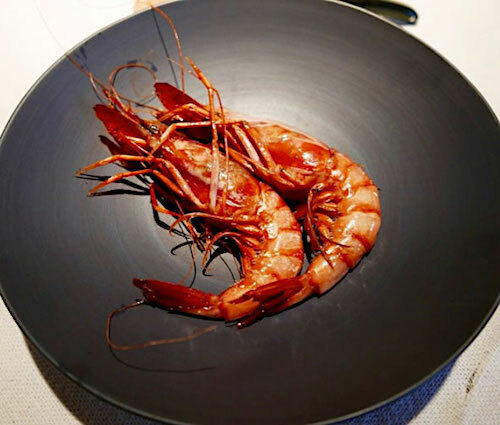 Helming the 6th best restaurant in the world, VICTOR ARGUINZONIZ, the chef-owner at ASADOR ETXEBARRI, is exceptional and so worthy of all the accolades he receives for his wood-fired barbecue of meats and seafood like this dish you will taste and never forget — GAMBAS ROJA from Palamos. A definitive must experience.